Lunch box food has come a long way since I was a child, but these Back To School Lunchbox Safety Tips have remained the same. Nothing brings back memories of grade school quite like the smell of peanut butter and jelly sandwiches! Whether your child is carrying their lunch every day or only on an occasion, following these back to school lunch box safety tips is a sure way to give them a happy and healthy school year. CHOOSE AN INSULATED LUNCH BOX. Old school brown bag lunches may be fun to reminisce about but they are not safe for most packed lunches. Insulated lunch boxes are available in multiple colors, designs and sizes for the smallest of lunches up to a large cooler style for picnics. Many are available for only $5-$10 online or in stores. KEEP FOOD AT PROPER TEMPERATURES. Whether you are packing milk to drink or a thermos of leftover soup, making sure your child has food that is at the right temperature is imperative. Food borne illness often stems from food that has not been kept at the right temperature. Use a thermos for hot items and invest in multiple freezer ice packs to keep cool foods cold at all times. DON’T CROSS CONTAMINATE. As always in the kitchen be super careful about handling raw foods and cooked foods in similar areas. As a busy parent you may find yourself wrapping up a sandwich for your kids lunch at the same time you are cooking breakfast in the morning. Make sure you keep cooked and raw foods separated and follow proper hand washing techniques. PACK HAND SANITIZER AND/OR TEACH PROPER HANDWASHING. As much as we would like to believe that our kids wash their hands before lunch at school, the fact is they likely don’t as often as we would desire. Make sure to pack a bottle of hand sanitizer in their lunch box and reach them to use it before handling food. Also spending a bit of time explaining the importance of hand washing before eating and showing them how to properly wash their hands goes a long way toward safety and good health. TEACH THEM TO SAY NO TO SHARING FOOD. While every kid has at some point opened their lunch box and sighed because they didn’t want another tuna sandwich, that doesn’t mean it is okay to share other kids food. Talk about germs, sharing food and the unhealthy habit it is with your kids. Make sure they know that no matter how yummy Joe’s pudding cup may look, sharing from a spoon he has already used is not a good choice. Practice what you preach and make an effort to not eat or drink after each other at home either. No lunch box is complete without a fun note from Mom or Dad. Check out our simple Free Printable Lunch Box Note Set that is perfect for printing and putting in your kids lunch boxes this school year! Simple click the image below or the direct link beneath it to print from the PDF. This year your child can have a great lunch experience when they pack their own lunch when you follow these back to school lunchbox safety tips. Not only can you work together to create fun and unique new lunch ideas, but you can help them to understand more about their body, food safety and how to stay healthy year round. 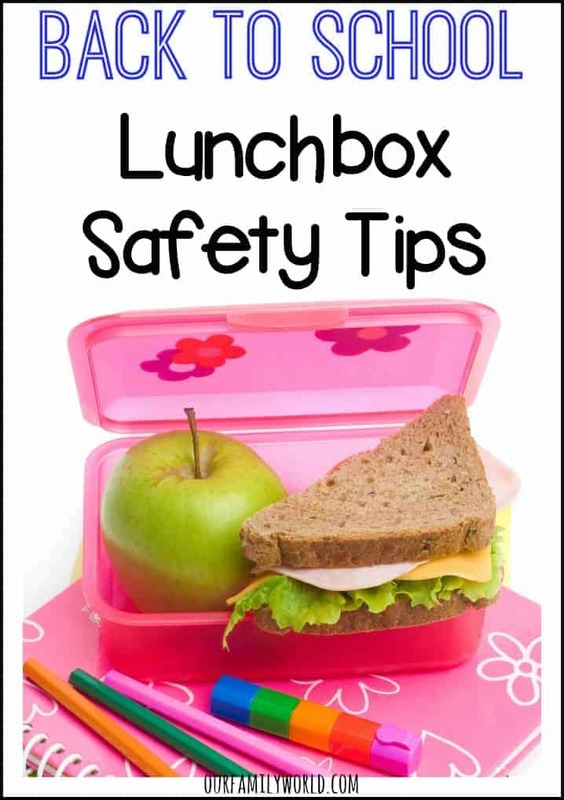 These lunch box safety tips are just another way to educate them on their own health and safety. Do you know of any back to school lunch box safety tips we missed? Tell us in the comments! These are great tips for back to school lunch safety. It is so important not to cross contaminate and to have the food staying at the right temp. The sanitizer is an awesome idea too. Thanks for sharing. These are great tips. I never thought about including a little hand sanitizer in the lunch box. My kids might like that. These are great tips. I agree about not sharing their food. Cleanline is very important, so I always tell my kids not to share. I have to agree with your points. In my opinion schools should not allow children to share lunches as there are many risks associated such as cleanliness, allergies, and quality. Good idea to teach kids the importance of hand washing, or using sanitizers before eating. There are so many diseases that can afflict young children if we do not teach them proper hygiene. Thanks for sharing. Good advice for moms whose kids are going back to school. Very good tips. Always good to have an insulated one.